Noel Chapman studied for his BA in Fashion and Textiles at John Moores University, going on to build a career in fashion design. After working with the London based Japanese designer Yuki he developed his own line, showing at London Fashion Week and selling to high end stores and independent boutiques in Europe and USA, including: Harrod’s, Harvey Nichols, Saks 5th Avenue, Bergdorf Goodman and I Magnum. He has since worked and consulted with designers, brands, forecasting and textile companies in Europe, China, Japan and USA. Noel has taught Fashion, Knitwear and Textiles in several UK Fashion Institutions including University of Brighton and Central Saint Martins, and collaborating with his great friend, Judith Cheek, written two books on fashion illustration: Creative Fashion Drawing and Secrets of Fashion Drawing, both published by Arcturus. 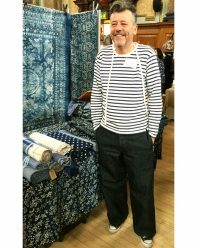 A few years ago Noel started collecting, and selling through his company, bleu anglais, the little known Chinese indigo textiles that he now specialises in and is researching for a future book. 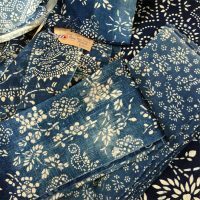 Vintage indigo folk textiles from rural China are the simple handwoven cotton fabrics of everyday country folk and are rarely seen outside of a village life that has now almost completely disappeared. 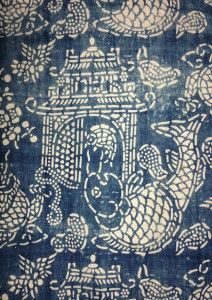 Noel will be sharing his experiences traveling in Asia and accumulating his collection of traditional Chinese indigo during his talk. He will be bringing some samples from his collection and is planning a “show and tell” component for his talk. It will be possible to purchase some of his pieces on the evening.